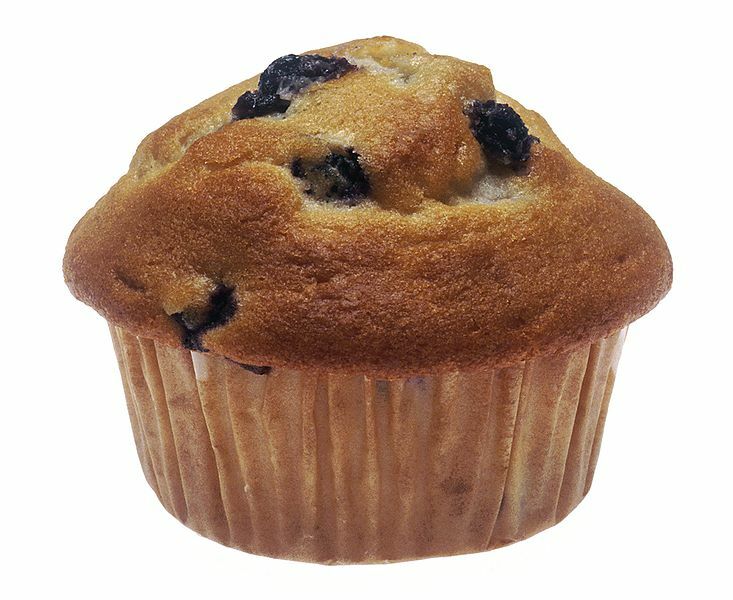 A muffin is a type of bread that is baked in small portions. Many forms are somewhat like small cakes or cupcakes in shape, although they usually are not as sweet as cupcakes and generally lack frosting. Savory varieties, such as cornbread muffins, also exist. Left: A blueberry muffin in a paper muffin cup. There are many varieties and flavors of muffins made with a specific ingredient such as blueberries, chocolate chips, cucumbers, raspberry, cinnamon, pumpkin, date, nut, lemon, banana, orange, peach, strawberry, boysenberry, almond, and carrot, baked into the muffin. Muffins are often eaten for breakfast; alternatively, they may be served for tea or at other meals. They generally fit in the palm of an adult hand, and are intended to be consumed by an individual in a single sitting. Muffins are made from a thick batter, and baked in a muffin tin, possibly lined with muffin liner. Muffins are characterized by a mushroom-like "head" or "crown" which is formed when the cooking batter rises above the top of the muffin tin. Muffins are usually sweet, and often involve berries suspended in the batter, such as blueberry muffins (see the recipe below). Grease muffin cups or line with paper cups; set aside. Preheat the oven to 400°F (200c). In a medium bowl, combine flour, sugar, baking powder, and salt. Make a well in the center of the mixture and set aside. In a small bowl, combine beaten egg, milk, and oil. Add this mixture all at once to the flour mixture. Fold in blueberries and stir just until combined. Do not overstir. Spoon batter into prepared cups, filling each about two-thirds. Bake for 18 to 20 minutes or until golden. When a wooden toothpick is inserted near the middle, it should come out clean. Remove from muffin cups and let cool on a wire rack for 5 minutes. The mixture should be lumpy after stirring. Otherwise, the muffins will be tough. Leaving the muffins in the muffin cups can make them soggy. To make jumbo muffins, reduce the temperature to 350° (180c) and bake for 30 minutes.